I’m sure you all are using viewport meta tag for responsive design, but did you know that the viewport tag can also be very useful for non-responsive design? If you haven’t got the time to convert your design to responsive yet, you should read this article on how to use viewport tag to improve the appearance of your design on mobile devices. It depends on the situation and result. Will need to see the site that you mentioned. I linked the page on my reply’s name. The setting is done in application.js in case you inspect it. The odd thing was, even if I threw out the (100% width) header & footer, so that only the fixed width (1064px) container was visible, the iOS devices were not scaling right – if I remember correctly the page was to wide. Anyway…a fun fact I found out with this project: the iOS devices refuse to load ( tag embedded) pictures that are larger than certain (pixel) sizes. Google for “Know iOS Resource Limits” and you’ll find a document on apple.com talking about this. I’m pretty sure though it’s outdated as it says “devices with 256MB RAM” and also the pixel-limit mentioned is not correct anymore. Note that this issue seems to apply for ALL devices – even the older ones, so it seems to be something that has changed with the iOS version. I tested it on all devices on xcode simulator + a real 1st gen Ipad + a real iPhone 4. Try reproduce if you like. Create a blank jpg file in photoshop. Embed it as an image tag into a html file (I used html5, not sure if that matters anyhow). Knowing this can save a lot of headaches when creating a mobile friendly image gallery (which is actually not used on the page I linked, it uses galleria.io). Maybe you want to blog about it some day. 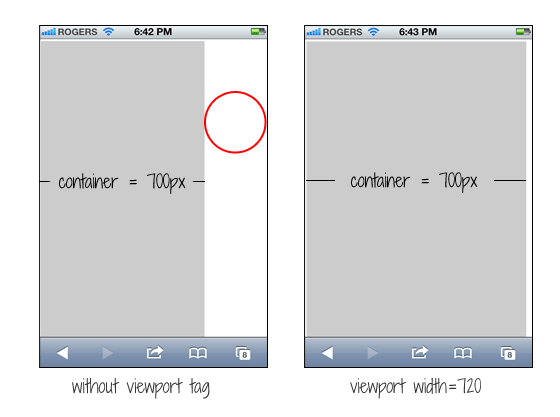 I didn’t know that viewport tags can be useful on non-responsive design, thanks for the tip. Nice advice, will keep in mind. Hi Nick, thanks for sharing. 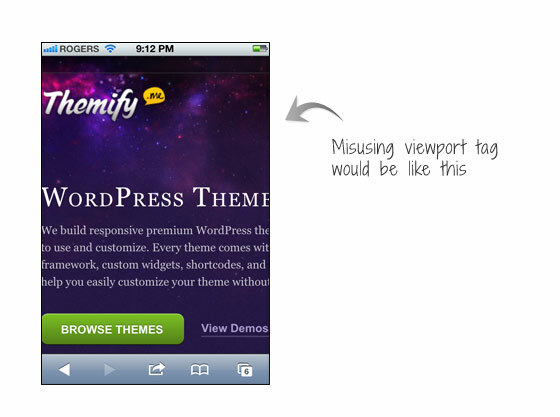 An out of topic question here, do you plan to upgrade Themify, so that it have responsive feature? Yup. Expect a Themify redesign soon. hey when i first found out that i could manipulate browsers to find my site easier it wasn’t working for me at all, then i found out put tags for however i would look for the site instead of how other people would, well then they started workin, thanks for the phone tip, thats how i started my page anyway…. this is what I was looking for as I’m in the phase of testing my website on mobile devices… i really didn’t like how it was displayed. It will look better now, thanks to this post. A very good thing to know. It helped in 1 of my project that I am working but not actually thinking to have a mobile website for it. Hey i just found this website and i think it is great! I enjoy reading your blog posts very much. I will continue visiting this website as it has great content. Great post. It’s always important that we design for both mobile and desktop. These small tricks will enhance your users experience greatly. WOW.. this is really nice share. I just want to say thanks for this post. well done, I now learned the importance of viewport. Thank you for such instructive article. Looking forward for more. I love the Themify site on the iPhone. Thanks for sharing this. Cheers! Thanks for the viewport meta tag information. I was just using it earlier today for a responsive design and was curious of it’s other uses. 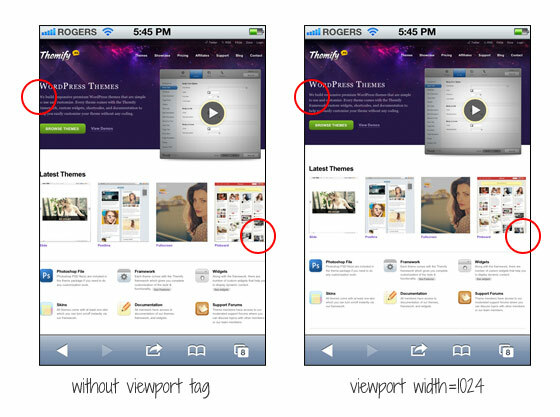 Very helpful tutorial on adding a viewport tag to specify the viewport width for non-responsive design. It seems to work in all Android versions. Ey, Nick, where U at? I’m impatiently waiting for Ur next articles to read. Greetz! I’ll certainly be adding that in to my sites in future, great info. Nicely written. I now understand the importance of the viewpoint tag and will use it properly in the future. Thanks again. I guess you learn something new everyday. I was not familiar with this meta tag. Not sure if this will come in handy anytime soon. Most website I work with are designed using media queries, for responsive design? This is very useful for our web designers. thanks for sharing…. Thanks for the tip. It is a great help for some issues with a current client. Problem solved. I think I will share this with my web design friends on Facebook. As we know that meta tag is one of the vital part in any web designing and this post deeply define its all aspects. This is an impressive detailed post about meta tag. Meta tag is too much important for the best designing, indeed. I totally agree with the common mistake, which usually people use to do. Meta tag is one of the vital part in any web designing. I fully agree, the common mistake, which mostly people use to do. It’s really helpful. Nicely written. Thank you for sharing.